Every once in a while, I’m reminded that the cycling culture here really is different to many (most) countries. Things we take for granted raise eyebrows elsewhere. Just last night, I was watching the Travel Channel and saw a short segment between programs, with a motorcyclist going on about his love of bicycling and how if he’s not on his motorcycle, he’s on a bike. As he rode around a picturesque village — in Lycra, wearing a helmet, and on a more race-style bicycle — it struck me how different things are here. No one thinks twice about cycling and it’s not just for pleasure or exercise; it’s a valid form of daily transportation. As for the mode of dress, Lycra, et al. are only worn by people who actually race or at least ride for sport, often with groups of friends. Here, people of all ages, in all types of clothing, ride for a variety of purposes. The differences were driven home yet again this morning when I saw an article about how a man in London was pulled over while taking his two girls to school in a bakfiets (see top photo). The police questioned the legality of the bicycle and the Daily Mail (admittedly, not a surprise that they’d not exactly get the story straight) referred to the bicycle as a “rickety wheelbarrow bike”, ignoring the fact that the bikes are sturdy, specifically designed, and cost more than €1000 easily. This is not a thrown-together mishmash of bike and garden tool. 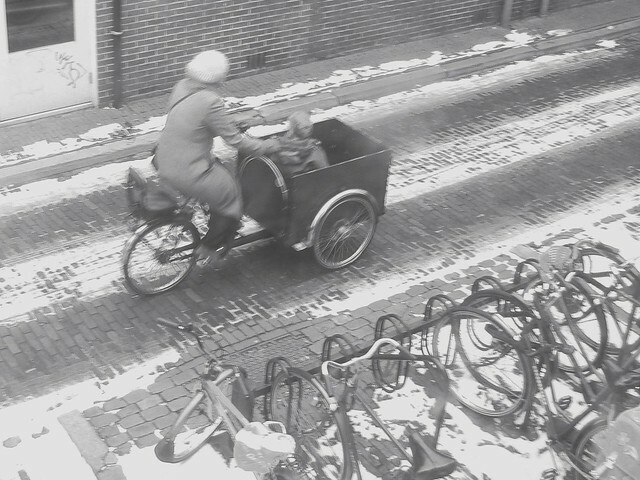 The man, who has been taking his girls to school in the bakfiets for four years, was allowed to go on his way, but it does drive home the differences in how bicycles are viewed in other countries. The stop came about because of a crackdown on unsafe drivers and cyclists after six cyclists were killed in just two weeks in London. A bike that is taken for granted here and used by thousands of parents is viewed as something alien and dangerous in other countries. There’s a push in many countries for better and safer cycling infrastructure, and not surprisingly, many of these proponents look to the Dutch cycling infrastructure as a good example. For those who say there’s too big a difference and it can’t be done, it is important to remember that the Dutch system didn’t really come about until the 1970s, after people started protesting the number of bicycle deaths. 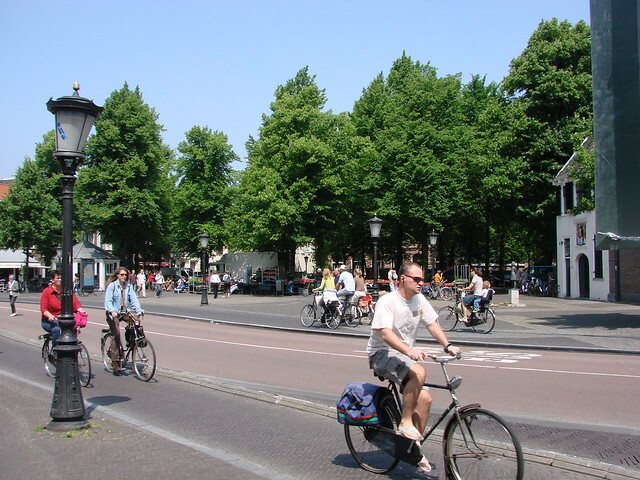 Pretty sure I’ve linked to it before, but it bears repeating: read this excellent post by Mark at the Bicycle Dutch blog about the development of the Dutch cycling infrastructure. Systems can change and I think encouraging more cycling would be a change for the better for a variety of reasons. Certainly, cyclists need to ride responsibly, but given the proper infrastructure, they’re less likely to be put into difficult situations. More importantly, drivers of all vehicles need to be respectful of cyclists. Too many drivers treat cyclists as a nuisance and seem to forget that their heavy vehicle can kill or seriously injure. By encouraging the development of proper infrastructure, drivers will benefit as well as cyclists. The result is that neither should hopefully be quite so angry or combative. No system is perfect, and I’ve heard complaints even here in the Netherlands from both drivers and cyclists, but the reality is that the system works well enough for it to be generally safe for cyclists everywhere, from small villages to the largest cities. This entry was posted in bikes, differences, news, photos, travel and tagged bakfiets, cycling in holland, cycling in london, cycling in the netherlands, cycling safety, dutch cycling infrastructure by Alison. Bookmark the permalink. Great article – apt, and well-sourced. Thanks! It’s been one of those cycling-heavy weeks when the topic seems to pop up a lot. When I think about the cycling differences between the US and NL I always get a crazy feeling. I think it says something about the way other countries look at “alternative” transportation and the way other countries look at what is considered “responsible parenting.” We biked a lot in Chicago, one of the more bike-friendly US cities, but even there the safest paths are similar to the most dangerous paths in NL. Or even when I think about the difference in accepting children on bikes – in Chicago even with a helmet and a seat with a high safety rating people would criticize – in NL, I’ve seen crazy contraptions to snap in an infant car seat, or even people just riding with an infant strapped to the parent with one of those belly carriers. My friends and I rode our bikes constantly growing up in the suburbs of Orlando and we never wore a helmet. Admittedly, we weren’t supposed to leave the neighborhood, but that didn’t stop us. In hindsight, I can see why our parents might have been concerned, but we were usually smart enough to avoid the actual busy roads. That said, as an adult, I’ve seen few busy roads in the US that I’d want to attempt on a bicycle, simply because there’s rarely actual space for the bike and a car at the same time and drivers in the US certainly don’t seem to respect people on bicycles enough. The key is to implement proper infrastructure whenever possible, but be consistent about it. That seems to be one of the biggest challenges, though. I definitely have a split personality when it comes to the whole ordinary bikes, ordinary clothes thing. At home in Ireland, I often try to point out that helmets, hi-viz and full battle gear with reflective lycra everything really aren’t requirements for short trips. But now, in the thick of a South-East German winter, I often find myself in the role of the completely dorky “committed cyclist” talking up the advantages of a little bit of battle gear to unfortunate, miserable cyclists who really look as if they could use some. When somebody in my yoga class who had fallen off her bike on black ice this morning asked me if I had taken a tumble, too, I said I had put my studded tyres on in the nick of time. I saw plenty of cyclists around town this morning wearing stylish winter coats and woolly gloves and scarves and bobble hats. The trouble with all this cycle chic, however, was that many of them looked a bit cold, uncomfortable, and worried about staying upright. Most of them were students – I wonder if they will still cycle once they have other options. I looked ridiculous in my dorky Irish “committed cyclist” getup amid all these civilized “people on bikes”. But I felt good. I was warm and dry in my Aldi waterproofs (black trousers, hi-viz jacket) and my fleece-lined lycra hat and my big waterproof mittens and my toasty cycling helmet. My yoga mat and blanket were dry in my Ortlieb pannier. My studded tyres had excellent grip even though the roads were like ice-rinks and the cycle tracks were worse. I’d like to think that we can advertise cycling by looking happy and comfortable as we cycle (and by not sliding all over the road on black ice) as well as by looking stylish and “Dutch” (or perhaps Danish.) With my current budget and my current priorities, I can’t quite manage both, although I do know the technology exists. But I see people here, truly of all ages, riding in all types of weather, still in regular clothing. Bad weather doesn’t stop the Dutch! 🙂 Of course, many people do have special pants and jackets that they put on over their regular clothing to protect them from rain/snow, particularly if they have a longer ride ahead, and lots of us do have panniers for carrying everything from yoga gear to groceries. In winter the Dutch cyclepaths are cleaned from snow and ice just like the roads. That helps too, off course. See the many BicycleDutch video’s on this subject . That’s right. Smaller (brick) streets may not be cleared, but if a road is cleared, so is the cycle path. I share your love for Utrecht, I’m moving my family back next summer. It’s my favourite city. Fantastic! I hope the move goes smoothly and you and your whole family enjoy this wonderful city! Interesting how opinions of what’s safe and normal can vary so much. Those bakfietsen are so common over here, and considerend perfectly safe. There’s an interesting presentation abut the Dutch cycling infrastructure and the differences with the American one on YT, look for “What can Seattle learn from Dutch street design” and you should find it. I’ve made the move btw Alison, but I still don’t have internet, unfortunetely. I was going to email you this weekend to see if you’d moved yet! Glad you’re in and hopefully you’ll have internet soon! I believe that Seattle video is one of Mark’s, as well. 🙂 He always does a great job of explaining various aspects of any cycling infrastructure and how they can be improved to make things safer for everyone, even here in the Netherlands. You mean from markenlei (I only know the username) on YT? No, this presentation is from some university I think. I know markenlei’s YT clips though, and David Hembrow’s. I find them fascinating to watch for some reason, even though what they show is so common for me 🙂 Makes me appreciate our cycling infrastructure even more. Mark/markenlei/BicycleDutch are all the same person and yes, it’s fun to see his (and other) videos, despite how normal it is here. Of course it’s also interesting sometimes to see comments from people in other countries, to see their varying reactions. Sorry to hear about the internet, particularly when it’s the result of poor planning on the builder’s side! Hopefully the radiator works at least, especially with the threat of bad weather for later on in the week! Some time ago I got interested in films and blogs about cycling. Until then I had never realised how dangerous cycling can be in some countries, especially the Engish speaking countries, and how The Netherlands serves as an example or even Utopia to the cycling activists. But I also soon realised that it is a small world, everybody seems to know everybody. One can see that in the video. Although it is interesting for a dutch person to watch such a video about The Netherlands, is is also clear that the presenter “preekt voor eigen parochie” (preach to the converted). Quite a large part of the audience already knew a lot about The Netherlands or had even visited it. Some of them knew words like drempel, or fietspad. One of them knew that Shell is not just Shell but Royal Dutch Shell, so no need to be amazed that a cycle path enters the largest oil refinery of Europe (owned by Shell). And somewhere in the video is a short discussion about a small supermarket in Groningen which seemed to have no parking space for cars. But a woman in the audience could tell them that there is a small parking behind the shop. She knew because the owner is her uncle.